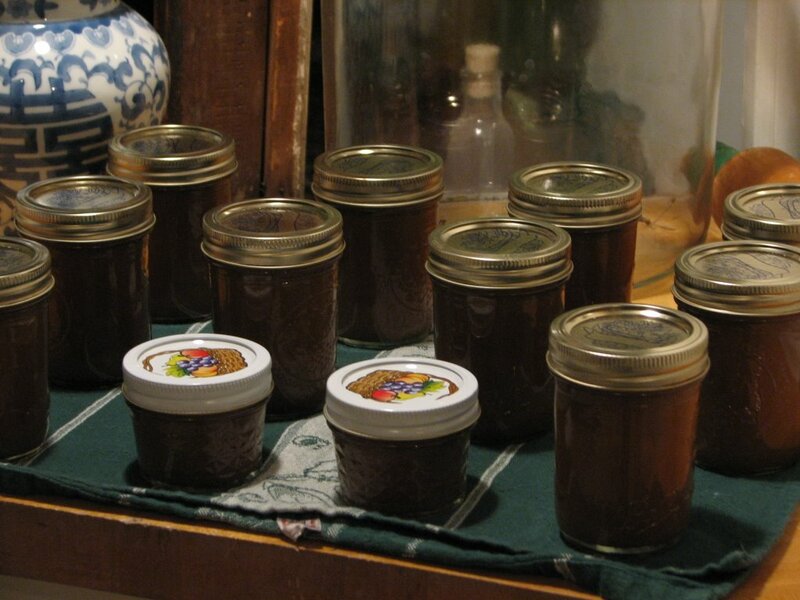 Today we made 2 batches of apple butter. Mom gave me about 5 lbs. of the apples she had picked with Carolyn at home (Havana). We bought another 3-4 lbs. today and spent several hours peeling, slicing, cooking down, stirring and canning them into some very tasty apple butter. At last, Autumn is here. Evan began his canning career last year when someone gave us a Walmart bag full of tiny pears. They were going bad, because we weren't eating that many. He already had an inkling to make some salsa and can it for Christmas gifts, but when he decided to make pear butter out of those gift pears, he caught the canning bug. He eventually canned 2-3 batches of hot hot and southwestern salsa, pear butter, and pickled garlic. Speaking of canning, jars, and such, while I was at home last week I had to get a ladder, lug it out to the saw mill and pilfer through several stacks of canning jars my dad had stored up in the rafters. 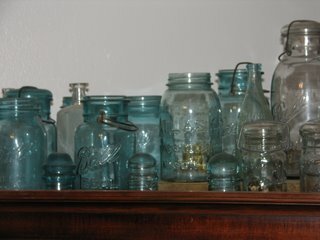 I was looking for any extra old blue jars to add to my old jar collection. I found 4 more. Here's a picture of my jars. I usually find mine like I did last week, in Dad's barn, in among the rafters of a building, or digging them up in our woods. "Meanwhile, in Buffalo, NY, William Charles Ball and his brothers (Lucius, Lorenzo, Frank C., Edmund Burke, and George Alexander) were in the business of manufacturing wood-jacketed tin cans for the storage of oil, lard and paints. In 1883, the Ball's changed from tin to glass containers and then, in 1886, to glass fruit jars. They moved their operations to Muncie, Indiana, after a fire at their Buffalo factory. Muncie (where a supply of natural gas had been discovered) was chosen because the city was offering free gas and land to rebuild the factory. " There's more about different companies and types of jars there. I think I have mostly Atlas and Ball. Canning reminds me of home and those hazy memories I have to think hard to think back to . . . my Dad used to can all sorts of stuff in the summer kitchen next to the house. Pints and pints of tomates, which he would drink all winter to keep from getting sick. The wonderful blackraspberry jelly he made when he had a grove of bushes. He would give almost all of them away at Roat Christmas. I guess we're carrying on the tradition. What wonderful memories! 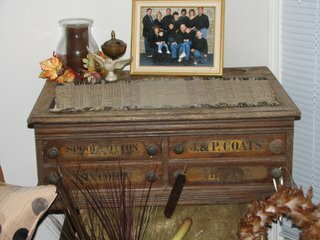 I do believe we are blessed with these as we carry on the legacy of family to generations to come. When will you write more interesting articles? ?